The Kranzle 1000 TST Quadro is robust unit for farm yards and tough environments where it could be damaged. 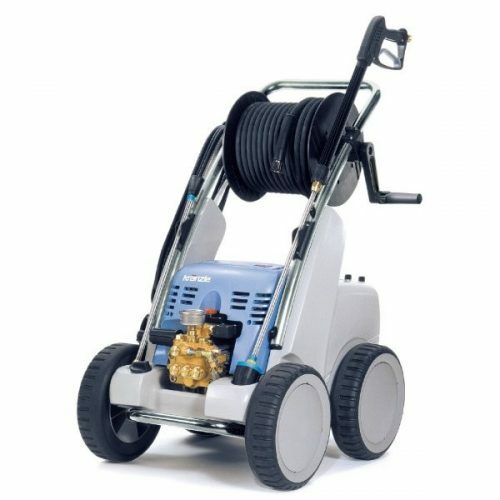 It has the capability to easily be wheeled around the the long hose reel to supply hose around the premises. Also, it has the flow rate and pressure to effectively clean large areas thanks to its 3 phase motor. “Low on pressure” o-ring kits or seals in brass head need changing, service required. “Taking out trips” Fault diagnosis required. If you’re in Wiltshire and need a service or repair on your Kranzle 1000 TST Quadro call, email or drop-in to our Bristol service and repair centre.